If you have ever grilled a vegetable than your mouth is likely already craving for this vegetable stuffed and grilled tomato recipe. This recipe combines many types of vegetables into a smokey flavored tomato that tastes as good as it looks. Many people have eaten stuffed peppers, but imagine surprising your guests or family with a grilled stuffed tomato appetizer? You will have them asking you for the recipe the second you bring them off the grill. Fire up your grill to medium-high heat and place the whole zucchini, onion, and green pepper directly over the flame and close the lid. Grill your vegetables for about 3 minutes on each side until you can see a good amount of char marks on the outside skin. Remove your vegetables from the grill and keep your grill lit in order to finish this recipe. Dice your grilled vegetables into small pieces and place into a mixing bowl. Add your olive oil, apple cider vinegar, and salt and pepper to the bowl and mix all ingredients together. Cut the very top portion of the tomato off where the stem is in order to prep them for stuffing. Hollow out the inside of the tomato with a spoon and place all of the mixing bowl ingredients into the 4 tomatoes. 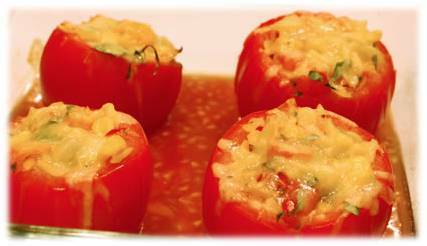 Add your shredded cheese to the top of each stuffed tomato that will melt over the top during grilling. Place your tomatoes on the grill so they are toward the outside or not directly over the flame. The hardest part about this recipe is making sure the bottom of the tomato doesn't overcook and start to fall apart. Leave your tomatoes on the grill for about 5 minutes or just enough to add a smokey flavor profile and warm them up.